For a printable copy of the FAQs, please click here. What is the ZAI Trust? W.R. Grace's plan of reorganization became final on February 3, 2014. Consequently, W.R. Grace has now funded the Zonolite Attic Insulation Trust from which eligible Claimants will be reimbursed for their legitimate ZAI Property Damage Claims ("ZAI PD"). Under the settlement, Grace will fund an Independent Trust and Claims Facility ("the Trust") that will operate for a minimum of 20 years paying claims and educating the public about the potential health effects associated with asbestos containing vermiculite/ZAI. Is it necessary or advisable to hire an attorney, professional consulting service, or “Public Adjuster” to help file my claim? No. While you are certainly free to hire someone to assist you with filing your claim, the Trust Distribution Procedures (“TDP”) are designed to enable you to file and complete the claim from start to finish without professional assistance. We encourage you to review the website and email us with any questions that you may have following your review. Our email is: info@zaitrust.com. We will do our best to respond as quickly as possible. Due to the high volume of calls and emails it is not always possible to stay on the phone with you as long as would be liked, but we are committed to getting you the information that you need. If you do hire an outside service the cost of those services is a private matter between you and them and is entirely your expense. I filed a claim several years ago. Why do I have to file another? All claimants, whether you filed the previous claim or not, are required to use the current claim form. During negotiations between W.R. Grace and ZAI claimants, several proposals were being considered to compensate ZAI claimants. One proposal included identifying existing claimants by having them complete a proof of claim form at that time. The ultimate resolution agreed to by the parties and approved by the court, however, established a set of evidentiary criteria and a new claim form that must be completed by all claimants. Thus, the basic claim form that you filed several years ago was replaced by a new one. Claims are reviewed in FIFO (First In, First Out) order. There is no way to predict how many claims may have been submitted before yours. Generally, we advise starting your claim and providing product identification evidence as soon as possible, and following up with your proof of removal and expenses as soon as you are able. How do I know if my vermiculite qualifies for reimbursement? To qualify for reimbursement, your vermiculite must be shown to be the Zonolite Brand. The various ways of establishing that you have the Zonolite Brand are set forth on the claim form. Approximately, 75% of the vermiculite used in homes is the Zonolite Brand. The approximate remaining 25% is not eligible for reimbursement. Therefore, just because you have vermiculite you should not automatically assume that it is the Zonolite brand. Only vermiculite abatement is included. Costs to abate other Asbestos Containing Materials ("ACM") such as pipe insulation, floor tile, lath/cement/plaster materials, etc. or mold remediation is not included. How much will be paid from the Trust for a ZAI Claim? The Trust may provide a reimbursement contribution of up to 55% of the abatement cost for eligible Claimants up to a ceiling of 55% of a $7,500 removal bill (or $4,125). For example, if you spent $7,500 removing and replacing the insulation, you are potentially eligible for the maximum reimbursement of $4,125. If you spent $3,000 for abatement and re-insulation, you are potentially eligible for reimbursement of $1,650 (55% of $3,000). Note: Claimants are strongly encouraged to submit ALL documented allowable expenses for vermiculite removal AND reinsulation, even if those costs exceed the maximum allowed claim value of$7500. Can I remove the vermiculite attic insulation myself? The EPA strongly recommends that "you should never attempt to remove the insulation yourself. Hire professionals trained and certified to safety remove the material." Although they don't recommend it, generally states allow homeowners to remove vermiculite from their own homes. Waste disposal regulations may vary from state to state and you should check with your regulatory authorities before attempting to remove or dispose of vermiculite. If you remove or contain the insulation yourself you are NOT eligible to have your labor cost reimbursed. You may, however, submit reasonable and necessary material costs associated with re-insulation and they will be considered within the evidentiary requirements of the Trust. While you may be eligible for potential reimbursement of the fair market rental cost of certain equipment (e.g. HEPA vacuum) you are not likely to be reimbursed for the purchase of such equipment. Similarly, items purchased that add to the value of your tool collection and are reusable will be subject to scrutiny and may not be eligible for reimbursement. If the house is jointly owned with my spouse or others, should the claim be in my name or all owners? The claim should be in the name of all owners even if only one of you is involved in the claims process. Any reimbursement check will be made payable to all owners (both spouses for example). With previous notice and agreement from all parties a check can be made in one name. By listing yourself as claimant you are representing that you are the sole owner of the house or building. You are also asserting that you are not aware of any other person(s) who may be entitled to assert a claim with respect to this property other than those whom you have already been disclosed to the Trust. If ZAI was installed in a structure which you own or rent, or have owned or rented, and you incurred expense removing, abating (to include re-insulation cost) or containing the ZAI, you are entitled to submit a Claim. In order for your Claim to be successful, and for you to receive compensation, certain evidentiary requirements must be met. Those requirements are set forth in the Claim Form and can also be found in Section 5.4 of the ZAI TDP. There may be instances, such as might occur in a real estate negotiation, where the parties agree as to who would have the rights to the claim. Absent such an agreement the Trustee will resolve any dispute as equity may dictate. Does the Trust reimburse commercial buildings with Zonolite insulation? Yes, the Trust applies to both residential and commercial buildings. Both residential and commercial buildings are subject to the same criteria when filing a claim and providing proof of ZAI, proof of abatement and expenditures. Are the costs to re-insulate included in the claim? Yes, they can be calculated as part of your claim as long as they are reasonably related to the costs and amount of vermiculite removal. They are not a separate claim. Costs to insulate additional areas beyond replacing the vermiculite insulation are considered upgrades and are not reimbursable. Does the Fund provide benefits for Personal Injury claims? Why is it called the "U.S." ZAI Trust? Although the ZAI Trust Claims Facility is not a government sponsored program, it encompasses each of the 50 United States. The designation "U.S. ZAI PD Claims" simply distinguishes the trust from a similar trust fund in Canada. Can the Trust recommend abatement contractors? No, however as a convenience please see "note to homeowners" under the Asbestos Abatement Professionals tab for a state by state contractor members of the EIA association. The Trust makes no representations or warranties regarding the services or any aspect of these companies. The Trust strongly encourages homeowners to get multiple estimates for all vermiculite abatement services including removal, testing and re-insulation. Can I make a claim for diminution of property value or economic loss? No. Although that 2008 Claim Form and bar date notice indicated that diminution of property value or economic loss might be compensable, those specific measures of damage were not part of the final settlement. Consequently, the fact that your home may have gone down in value due to the presence of ZAI is not, in and of itself, compensable. What is compensable is a portion of the money you have spent, or will spend, removing and replacing the asbestos containing ZAI from your structure. What type of proof of payment is acceptable? Every effort should be made to provide copies of original invoices or proposals. Invoices and proposals produced after the fact will be subject to additional scrutiny. Cash payments will be subject to a higher level of scrutiny including confirmation by the abatement contractor. To help ensure that your claim meets the necessary requirements, claimants are strongly advised not to make cash payments for abatement and reinsulation projects. Note: The Trust cannot reimburse expenses for remodeling and general upgrades. The Trust can only reimburse expenses directly related to the abatement. Therefore, every effort should be made to separate out the cost of vermiculite abatement activity versus other general construction. It is strongly advised that your contractors include the break out in their proposal and invoice. Can Payment from the ZAI Trust be made direct to the abatement contractor? Yes, under some conditions. There may be incidences in which a homeowner and abatement contractor reach an agreement whereby the Claimant authorizes the Trust to pay the compensation directly to the contractor. In that event, as discussed in the "abatement expense" section of the form, you must provide proof of payment of the non-reimbursable portion. In other words, if you have a successful Claim of $5,000 in abatement costs and have authorized payment to the contractor, the Trust can pay the contractor $2,750 directly (55% of $5,000). You must, however, have proof of payment of the remaining $2,250 (45% of $5,000). Utilizing this option does not create a contract, either express or implied, between the ZAI Trust and abatement contractor. Payment to the contractor is contingent on the claimant providing acceptable evidence of his or her payment obligation as well as compliance with all other provisions of the Trust Distribution Procedures. Please note that reimbursement is based only on vermiculite abatement cost and such costs as are reasonably related to the abatement. For example, if a contractor performs $5,000 worth of work, but $2000 is unrelated to the vermiculite abatement, then only $3,000 is considered for reimbursement. In this case, the reimbursement amount would be $1,650 ($3,000 x 55%). In order for the Trust to pay the contractor the $1,650 directly, the claimant must show proof that he paid his 45% portion, i.e $1,350($3,000 x 45%). Can I rely on my contractor to submit my claim and the necessary documentation? NO- You are responsible for reading the claim form instructions carefully (www.zonoliteatticinsulation.com/g/Sampling-Instructions/Claim-Form-Instructions) and insuring your compliance. Ultimately you will be declaring by your signature that you have read and complied with the Instructions. Contractors will often assist a homeowner in gathering the necessary information and photos but that is strictly between you and them. The Trust is NOT a party to any agreements with your contractor, written or oral, and is not responsible for any actions or omissions on their part. Falsified or non-authentic documents or photos provided by you, or your contractor on your behalf, may result in your claim being denied and criminal and/or civil penalties being pursued. You should discuss the necessity of providing accurate and authentic information with your contractor prior to the beginning the claims process. How do I safely take a sample to submit for testing? Step by step instructions are contained in the Sampling Instructions page of the website. Be sure to label your sample with the date, location (e.g. "middle of attic"), property address, claimant name, and name of the person collecting the sample. Be sure to also include the Chain of Custody form with your sample. 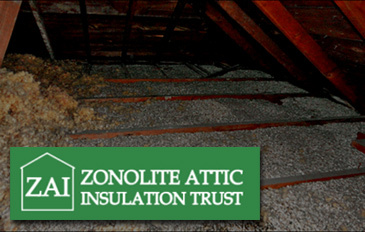 Please note that if your vermiculite sample results are non-consistent with the Zonolite Attic Insulation product, the Trust is willing to test up to two more samples at no cost to you. Can I have my sample analyzed by the Trust before filing a claim? You can pay for your own sampling and analysis at anytime, however, you must at least open a claim before submitting a sample to the trust for analysis. How do I contact the ZAI Claim Facility? Please contact the Trust via email, phone call, fax, or mail with any questions. Due to high call volume, you are encouraged to use email for the quickest response. Will the Trust send a professional to my home? If deemed necessary by the Trust, a home inspector may be sent to verify the status of the vermiculite abatement. By signing Part V of the claim form, the claimant agrees to cooperate with the inspection and allow access to, and photographs, of the area in question. Are "Before and After" pictures necessary? Can I file a claim if I have not yet removed? Yes. In fact, we encourage you to do so if you believe you have vermiculite. You can go ahead and begin the Product ID process and your claim status will be “pending” until such time as you do incur abatement costs and submit that information to the Trust. There is no timeline or deadline to remove simply because you began the claims process. See also FAQ #18 regarding sampling procedures for the Product Identification Requirement. Should I send my sample FedEx or overnight? No, it does not need to be sent over night or any sort of priority. Regular mail is fine. There is no deadline for filing the claim. However, if time is of the essence, for example abatement is scheduled to be done quickly you may wish to use some method of priority mail. My abatement contractor assured me that I will qualify for reimbursement. Is that sufficient to make the Product Identification requirement? No. The only way to know for sure if you will qualify for reimbursement, i. e. that your vermiculite is the Zonolite brand, is to submit your product identification evidence to the Trust for evaluation. We strongly suggest you do this before removing the material and request that you follow up by email as to the status of that determination. What if I disagree with the Trust’s decision? Appellate rights are set forth on page 18 and 19 of the Trust Distribution Procedures (“TDP”). You can view the TDP on our General Information tab. Mediation, if requested, must be done within thirty days following the decision on your request for reconsideration. Arbitration, if any, must be requested within thirty days following the conclusion of mediation. How soon will I receive my partial reimbursement following the approval of my claim? Generally, you should expect to receive your partial reimbursement no later than 45 days, and often, much less, from the day your claim is approved. Please keep in mind that in order for your claim to be approved you must have provided proof of the abatement as well as payment for the abatement. That documentation must be reviewed and confirmed before it is approved. Due to the large volume of claims received, claims are evaluated on an ongoing basis but are paid in batches. Since the EPA advises homeowners to assume that vermiculite contains asbestos, is it still necessary to prove that the product is the Zonolite brand? Similarly, since certain states, such as New York, mandate that vermiculite be treated as an asbestos containing material, (“ACM”)is it still necessary to provide evidence that the product is the Zonolite brand, i.e, meet the product identification (“PID”) requirement? YES and YES. During the negotiations leading to the settlement of the nationwide class action and creation of the Fund it was determined that the product identification requirement must be met. The Zonolite brand of vermiculite comprises approximately 75% of the vermiculite in the country. It is that 75% that the fund was designed to help mitigate. THE TRUST TAKES FRAUD AND ATTEMPTED FRAUD VERY SERIOUSLY AND UNDER SOME CIRCUMSTANCES IS REQUIRED TO REPORT FRAUD OR SUSPECTED FRAUD TO THE U.S. BANKRUPTCY COURT. THE TRUST WILL INVESTIGATE SUSPICIOUS CLAIMS AND APPLY HEIGHTENED SCRUTINY AS IT DEEMS WARRANTED. FRAUD AND CONSPIRACY TO COMMIT FRAUD ARE VIOLATIONS OF BOTH STATE AND FEDERAL LAWS AND CAN EXPOSE A CLAIMANT AND/OR ANYONE PARTICIPATING OR ASSISTING IN THE FRAUD TO BOTH CIVIL AND CRIMINAL SANCTIONS. A PROFESSIONAL (AND HIS COMPANY) SUSPECTED OF ASSISTING A CLAIMANT WITH A FRAUDULENT CLAIM WILL ALSO BE REPORTED TO THE STATE LICENSING BOARD. "IMPROPER OR FRAUDULENT CLAIMS ACTIVITY... TO THE EXTENT ANY NONCOMPLIANT PAYMENTS WERE MADE AS THE RESULT OF FRAUDULENT CONDUCT ON THE PART OF A CONTRACTOR, CLAIMANT OR OTHER PERSON, THE ZAI TRUSTEE SHALL NOTIFY THE BANKRUPTCY COURT AND THE UNITED STATES ATTORNEY FOR THE DISTRICT OF DELAWARE OF SUCH FRAUD AND SHALL PROVIDE ALL INFORMATION THOSE ENTITIES MAY REQUEST IN CONNECTION WITH ANY INVESTIGATION, CIVIL PROCEEDINGS OR CRIMINAL PROCEEDINGS. THE PD TRUST MAY ALSO INITIATE LITIGATION AGAINST THE RESPONSIBLE PARTY OR PARTIES TO RECOVER SUCH NONCOMPLIANT PAYMENTS."